Born in Jackson, Michigan, Philip Curtis became one of the early painters from the East in Arizona, and some critics later referred to him as Arizona’s greatest painter. His landscape and figure paintings, many of them full of whimsy, are called “magic realism” and with recognizable forms but incongruous relationships, his paintings also have many elements of surrealism. As a child, he had an accident at age 16 that determined much of his life. He fell through thin ice on a lake and from that time suffered crippling arthritis. He had always shown an interest in drawing, but planned to be a lawyer. He was educated at Albion College and the University of Michigan Law School, but after the first year, he realized he did not want to be a lawyer. In 1932, he began formal training at the Yale School of Fine Arts where he got a four-year certificate. But his studies there frustrated him because they were so oriented towards the classical artists, and he wanted to find out what was happening in art in today’s world. He went to New York and got a job in the murals division of a Works Progress Administration project. His WPA assignment was in Phoenix, Arizona where he founded and served as Director of the Phoenix Art Center, predecessor of the Phoenix Art Museum. In 1939, he went to Des Moines, Iowa, to start a similar project there, and having become interested in museum work, he took a museum administration course at Harvard University. In 1947 at age 40, he returned to Arizona to paint and settled for the remainder of his life in Scottsdale. 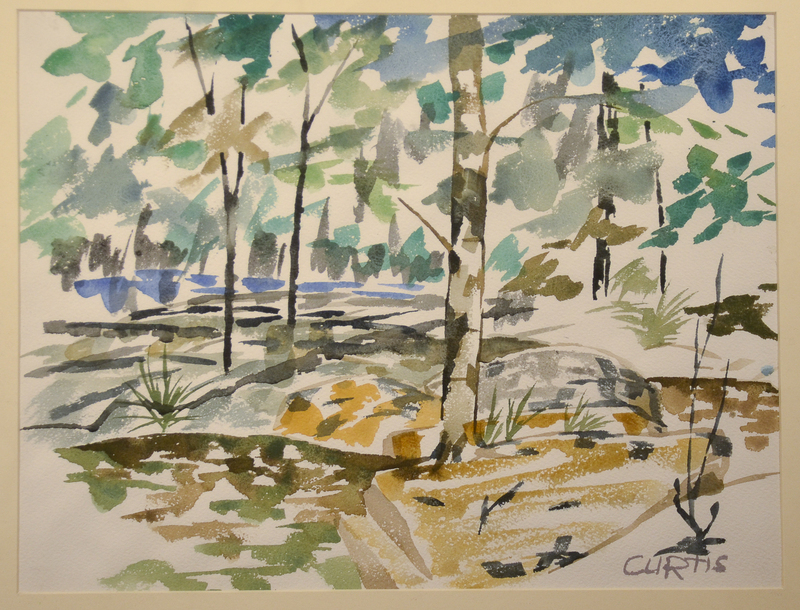 The climate was good for his arthritis, but he lacked funds, so in 1960, Lewis J. Ruskin put together a group of ten persons who created the Philip C. Curtis Trust through which $25,000 was loaned to the artist to free him of any work except painting. This period of concentration led to successful exhibitions and sales in New York and Europe as well as in Arizona, and ever since, he has been well known in art circles. Into his nineties, he continues to paint every day.